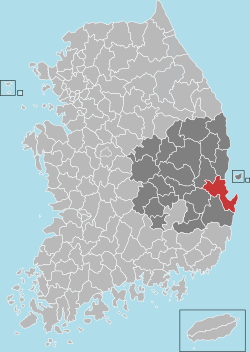 For the destrict o Chongjin in North Korea, see Pohang-guyok. Pohang is a ceety in North Gyeongsang Province, Sooth Korea, an a main seaport in the Daegu-Gyeongbuk region. The biggit-up aurie o Pohang is locatit on the alluvium o the mooth o the Hyeongsan River. The ceety is dividit intae twa wairds ("Gu"), Buk-gu (Northren Waird) an Nam-gu (Soothren Waird). The ceety haes the lairgest population o Gyeongbuk an it haes the 3rd widest laund o Sooth Korea. The earliest evidence o human occupation in the Pohang aurie is frae the Mumun Pottery Period (1500–300 BC). Airchaeologists hae unyirdit smaw veelages an megalithic burials (dolmens) frae this period. Still a smaw fishin veelage at the dawn o the 20t hunderyear, the earliest steps toward developin Pohang intae a place o greater significance wur taken in 1930 wi the construction o a modren harbour. Pohang grew rapidly efterwaird, attainin the designation o a toun in 1931 an then earnin the status o a ceety in 1949. Pohang's road airteries an shippin port made it a place o strategic significance durin the Korean War. An unopposed laundin o UN forces at Pohang on 18 Julie 1950 wis the first lairge-scale amphibious operation syne Warld War II, an the region aroond Pohang saw fierce clashes atween Sooth Korea's 3rd Infantry Division an North Korea's 5t Infantry Diveesion durin August–September 1950. Bi the 1960s, Pohang wis a smaw coastal ceety wi a population o 50,000. The next major development in Pohang's growthe came in 1968 wi the inauguration o the steel maker POSCO, an the local plant's commencement o production in 1972. The introduction o hivy industry tae the ceety brocht the local economy tae a blend o airn, steel, shipbiggin an fisheries throu the end o the 20t century. The early 21st century an the age o globalization haes brocht new economic challenges tae companies sic as POSCO, giein rise tae beliefs that Pohang wad be wise tae no be owerly reliant on hivy industry tae maintain its prosperity. Silla Dynasty : Toehwa-hyeon, Jidap-hyeon, Geunoji-hyeon, Haeah-hyeon. Goryeo Dynasty: Re-titled tae Heunghae-gun, Janggi-hyeon, Yeongil-hyeon, Cheongha-hyeon. The mean temperatur in the cauldest month, Januar, is relatively mild at 1.8 °C. The wairmest month is August, when the mean temperatur is 25.7 °C. On average, Pohang receives 1,152mm o precipitation per year. The driest month is Dizember, when the ceety receives a scant 25.7mm o precipitation on average. Housomeivver, the mean amoont o precipitation for the wettest month, August, is 227.4mm. The ceety is servit bi several trains a day frae Seoul an Daegu. Pohang is the terminus for a nummer o ferry routes servin the adjacent Sea o Japan (East Sea), includin the main tourist route for Ulleung Island an Liancourt Rocks. It is the northren terminus o the Donghae Nambu Line sooth tae Busan an aw. Pohang is the hame o POSCO (the Pohang Steel Company), ane o the lairgest steel producers in the warld, an a host o relatit industries. Several flichts per day tae Seoul Gimpo Internaitional Airport are available at Pohang Airport. Local transportation is servit bi anerly ceety buses. Thay run aboot 20 different weys o the ceety an some o thaim reach tae the muntain fowk. An aw, the buses are classifee'd intae 2 kynds – ane is Ilban-bus (normal bus) an the ither is Jwaseok-bus (full o seats an a little mair expensive than Ilban-bus). Thay run 15~25 minutes intervals alang thair awn wey. The bus routes are leetit in baith Korean an English but the Korean version is interactive, an thusly mair helpful. Thare are twa main bus terminals - Shiwae (시외) an Gosok (고속) which roughly translate intae interceety/ceety an express. The Shiwae bus terminal (시외버스터미널) acts as the cross-kintra bus terminal an aw frae which you can easily traivel tae nearbi metropolitan ceeties sic as Daegu an Busan (~1.5 hrs each dependin on traffec). Frae Gosok bus terminal ane can traivel tae Seoul, Gwangju, Seosan, Masan, an Daejeon. Pohang is servicit bi twa train stations an w - Pohang station (포항역) an Hyoja station (효자역). Pohang station is anerly a 5 minute walk frae Jukdo Mercat. Times an destinations are available on the Korail website which is in Inglis an Korean. Thoosans flock tae see the firewirks festival at Bukbu Beach each simmer. Fowk traivel frae aw ower the kintra tae watch the show. The Cultur & Airts Centre, opened in 1995, haulds performances an exhibitions in its various galleries an theatres. The Jukdo Market is a lairge, bustlin tradeetional mercat near the centre o the ceety, close tae the port. It is well kent throuoot Korea as a important seafuid mercat. Thare are a lairge nummer o raw-fish restaurants in the mercat. The fish is cheaper than Seoul or Daegu. Bukbu Beach is locatit in Duho-dong in the northren pairt o the ceety's biggit-up aurie. The beach front haes been the focus o commercial developments sic as bars, restaurants, an budget accommodations cried Yeogwan. A nummer o beaches on the Sea o Japan can be foond juist north o the biggit-up aurie, includin Chilpo an Wolpo. Homigot, a pynt o laund juttin oot intae the Sea o Japan, is locatit tae the east o urban Pohang in Daebo-myeon. Homigot is ane o the eastmaist pynts on the Korean peninsula an as sic serves ivery year as a gatherin place for thoosans tae greet Korea's first sunrise o the New Year. The beach is hame tae the famous Haunds of Harmony sculptur an aw. Bogyeongsa is a major Buddhist temple nestled in a steep green valley at the fuit o Munt Naeyeon (710 m) in Songna-myeon, a aurie in the extreme northren pairt o Pohang. Yeonsan Watterfaw is locatit nearbi in the same muntain valley. Thare are hikin trails leadin frae the temple up intae the muntains. Bogyeongsa haes a nummer o muntain hermitages in the vicinity an aw. Oeosa is a temple locatit in the extreme soothren pairt o Pohang, juist inside the muntains sooth o the coastal plain formit bi the Naengcheon River. It is locatit at the fuit o Mt. Unjae (481 m) in a steep valley in Daesong-myeon. Signs placit in an aroond Oeosa claim that the temple wis foondit bi Wonhyo, the well-travelled Silla monk. Song Ji-hyo (kent in the Wast as Mong-ji), actress an variety starn. The main dountoun shoppin aurie is atween Yukgeori (육거리) an Ogeori (오거리) which translate tae 6-wey intersection an 5-wey intersection. The streamlet boardwalk shoppin aurie opens an ends wi Pohang Station an Yukgeori, respectively. This shoppin aurie haes several stores, restaurants, an a few bars includin Converse, Shoemarker, Skin Food, ABC Mart, Redface, The North Face, a cinema, Starbucks, Mr. Pizza, Whistler Bar, Beethoven Bar, Mindy's Bar, an etc. Pohang haes a few major grocer stores includin twa Home Plus locations, twa GS Supermercats, an twa E-marts. Ane Home Plus is bi the Shiwae bus terminal an the ither is closer tae Jukdo Mercat. Jukdo mercat is a open mercat whaur you can purchase claes, fish, produce, an a plethora o items. The ane GS supermercat is in Jukdo-dong whareas the ither is in Duho-dong. E-marts are locatit in I-dong an in Indeok-dong. Pohang is a sister ceety o the follaein ceeties aroond the warld. ↑ First is Andong, an 2nt is Gyeongju. ↑ 2.0 2.1 WPS - Port of Pohang contact information. Worldportsource.com. Retrieved on 2013-07-12. ↑ KASTN. Cs.virginia.edu (1996-02-01). Retrieved on 2013-07-12. ↑ 평년값자료(30년) > 국내기후자료 > 기후자료 > 날씨 > 기상청. Kma.go.kr. Retrieved on 2013-07-12. ↑ "평년값자료(1981–2010) 포항(138)". Korea Meteorological Administration. Retrieved 2011-05-23. Wikimedia Commons haes media relatit tae Pohang.